Angel Number 808 Meanings – Why Are You Seeing 808? Home Numerology Angel Number Meanings Triple Digit Angel Numbers Meanings Angel Number 808 Meanings – Why Are You Seeing 808? Some days give you a strange feeling in your gut. You sleep in, jolting awake, you see that it is already 8:08am. In a rush, you skip breakfast at home and grab coffee and a muffin on your way. The cashier asks you for $8.08. Just when you think your day is getting better, you lose your password to an important system. You receive a new one, which ends in 808. While part of you thinks this is all just a coincidence, you know in your gut that something more is going on. You are seeing Angel Numbers. What could the triple digit Angel Number 808 be trying to tell you? What does Angel Number 808 mean for love? Angel Number 808 is one of the less common Angel Numbers, as it centres on the number 0. This refers to both everything and nothing at the same time, all potential possibilities and the void. The number 8, the influence of which is doubled, is a number of action, but more potently the consequences of our actions. Angel Number 808 also culminates in the number 7, as 8+0+8=16, which further reduces to 1+6=7. The number 7 is linked with knowledge of all types, but in particular the spiritual and the esoteric, that we obtain with our less well-understood senses. Angel Number 808 suggests that we have a blank slate before us and can move forward in whatever way we wish. But make wise decisions, as our actions will have far-reaching consequences. Our lives cycle through stages, but while we can remember a time when something that now seems insignificant was hugely important, we cannot imagine a time when the things that are now important will be meaningless. Angel Number 808 can appear to remind us that this is not true, and that something you are obsessing over now, will very soon be meaningless. Let go of it, free yourself from it, and you will be able to move forward. Soon, it will just be another memory. Sometimes we choose not to learn new things or listen to new information. Perhaps we think that we already know everything we need to know. Angel Number 808 is a reminder that we never stop learning, about ourselves, about others, or about the universe. Never reject new knowledge because it does not align with what you already know. Each of us knows so little. Do not let what you know now limit and dictate what you will know in the future. Be open to learning new things, no matter where they come from. You are likely about to learn something that will shake your foundations in some way. For some reason, we can find ourselves at a point in your life where we have a blank slate, and the things we have done in the past are not constraining what we can do next. While this is a time of huge opportunity, it is also a time of huge responsibility, as it gives the decisions that we make now more weight in terms of how they will shape our future. Angel Number 808 can appear to tell us, yes, enjoy this moment of freedom, but use this opportunity carefully. Make decisions with the long term in mind and do not be distracted by immediate gratification. While you can work to earn back another person’s trust, forgiveness is not something you can earn, it is something that another person chooses to bestow. 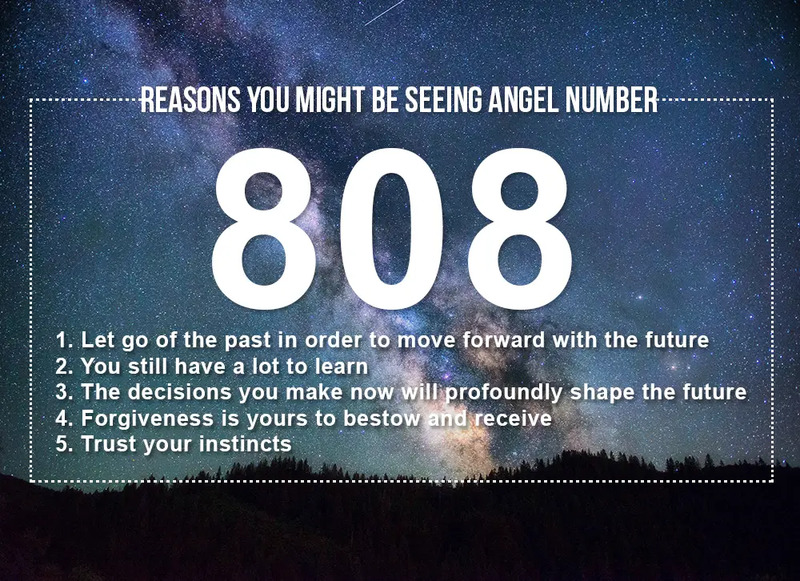 The 808 Angel Number often delivers a message about the importance of forgiveness and giving someone a fresh start. Perhaps there is someone in your life that you need to forgive, not only so that you can more forward with your relationship, but so that you can lift the heaviness of resentment from your heart. On the flip side, perhaps you need to accept someone else’s forgiveness. Maybe you do not feel like you have earned it. You do not need to earn forgiveness, it is their gift to give. You can repay them by learning from your mistakes. Since Angel Number 808 resonates strongly with the idea that actions have consequences, you would think that you should think through every decision in detail, so you always know what you are getting yourself into. While it is a good idea to weigh all your options before acting, Angel Number 808 can show up when option weighing has tipped over into procrastination and avoidance. It can tell you that you have all the information that you need, and it is time to trust your decision making skills and your gut, and to act. If you wait much longer, the choice of what to do may be taken out of your hands. 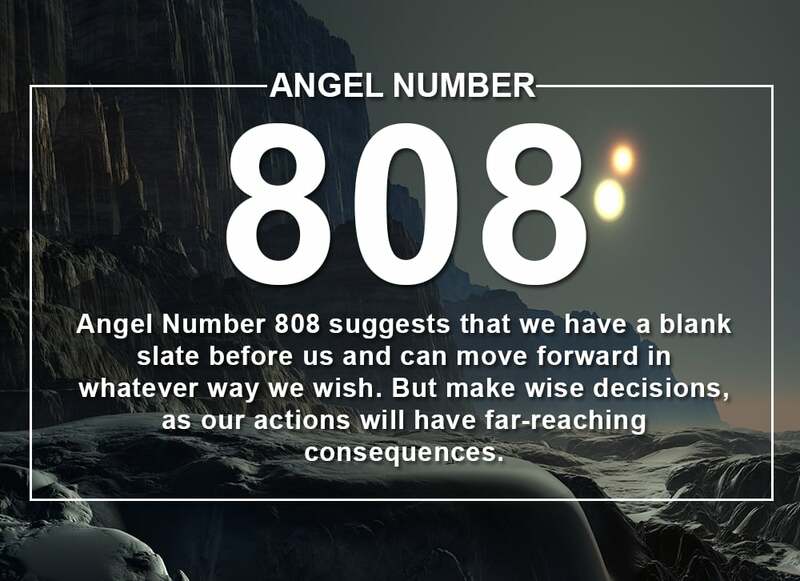 Angel Number 808 often appears when you are going through a dark or difficult time in terms of relationships. Perhaps you are feeling lost after a bad break up, or you are feeling disheartened after a series of disappointments. Perhaps your relationship is going through a rough patch and you are fighting more than usual, or you no longer feel like you are your partner’s priority. Angel Number 808 assures you that this dark period will soon come to an end. Something will happen in your life that will make you realise that you are deserving of love, and this will enable you to do the things you need to do in order to move forward. This might be difficult, as sometimes it takes hitting rock bottom – or at least what you perceive at the time to be rock bottom – to be able to transform yourself and move forward. If you see the Angel Number 808, embrace it as a positive sign. That the angels have decided to intervene in your life, and that you are ready to see and hear their messages, is a good sign that you are on the right path. The 808 Angel Number is complex, and the message it has for you is unique to you and your situation. In order to decipher your special message, pay attention to what you were doing or thinking when the number appeared to you. The Angels will reveal their numbers to you within a context that gives you the clues you need to decipher their message. Do you seek guidance and insights into the past, present and future, with regards to relationships, love, or money? 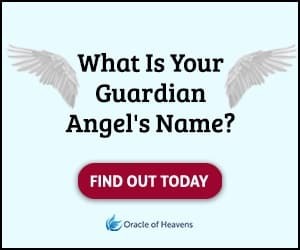 If you are frequently seeing the 808 Angel Number, take this popular free test to see whether your Guardian Angel is trying to send you an urgent message. Keep seeing 808? What could Angel Number 808 be trying to tell you? It may suggest that our actions will have far-reaching consequences. Full meanings here! Angel Number 616 Meanings – Why Are You Seeing 616? Angel Number 711 Meanings – Why Are You Seeing 711? Angel Number 313 Meanings – Why Are You Seeing 313? Angel Number 818 Meanings – Why Are You Seeing 818? Angel Number 717 Meanings – Why Are You Seeing 717? Angel Number 911 Meanings – Why Are You Seeing 911? Angel Number 000 Meanings – Why You are Seeing 0:00? Angel Number 999 Meanings – Why Are You Seeing 999? Angel Number 888 Meanings – Why Are You Seeing 888? Angel Number 777 Meanings – Why Are You Seeing 777? Angel Number 666 Meanings – Why Are You Seeing 666? Angel Number 333 Meanings – Why You are Seeing 3:33? Angel Number 111 Meanings – Why Are You Seeing 1:11? Angel Number 222 Meanings – Why Are You Seeing 2:22? Angel Number 555 Meanings – Why Are You Seeing 5:55? Angel Number 444 Meanings – Why Are You Seeing 4:44?